Ah, the dark nights are coming and for once I’m over the moon about it. 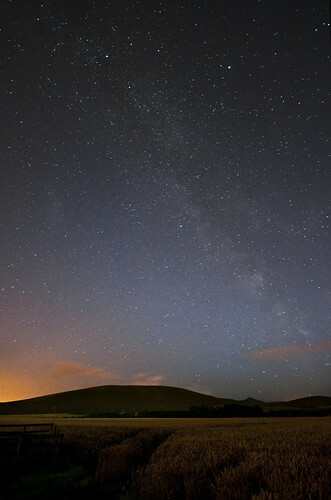 Dark nights and colder days mean longer dark clear nights with means longer to check out the celestial displays above. I’d always viewed the summer nights are preparation for the winter when I’d really be able to get into the astro-photography and after what seems like the worst summer in living memory it’s just about upon us. For once Edinburgh had a rare happening. A weekend night with a clear sky. Normally the sky clears when I’ve got to be up at half 6 in the morning so it was nice to see it on a Saturday night for a change. So, out went the scope about 9.15 to cool down, this time, I was going to do everything right. I even had a go at EQ aligning the NexStar SE5. This telescope has a built in basic wedge (I mean really basic but it’s better than not having one!). The alignment process seemed like something from the Krypton Factor but thanks to this blog (http://astroadventures.wordpress.com/) I found I was able to figure it out and it’s not really that hard! So, with scope levelled, aligned and the precise GOTO working while the sky was getting darker I let my nephew play about with the skytour on the handset, you have to encourage potential young astronomers don’t you? Encourage maybe but little did I realise what the half hour of near constant slewing of the scope was about to do. All was well until we homed in on M57, the Ring Nebula. There it was nice and clear. 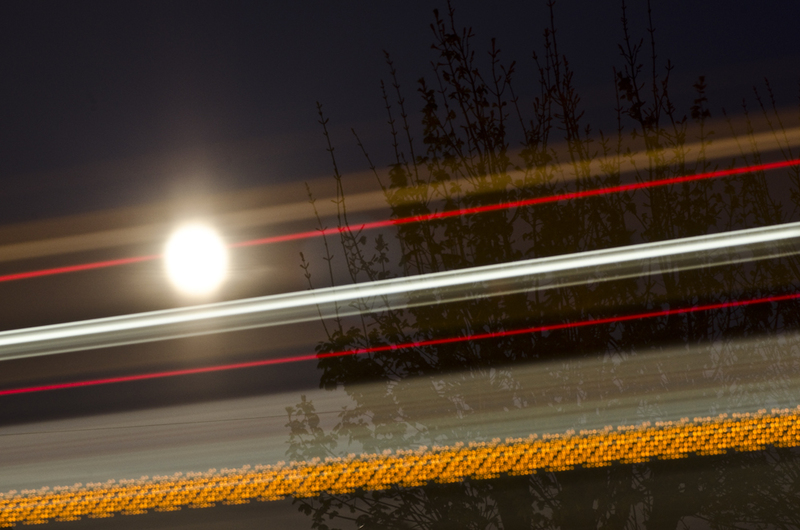 Camera onto the visual back, couple of shortish exposures to get the focus and all was good. Started ramping up the exposure times with the D7000 tethered to my MacBook, even better I was getting 30s exposures with no trailing and loads of stars so I set the MacBook to keep taking shots and walked away and left it. 5 shots in I noticed a problem. Those nice stars were more like lines, not just elongated stars, lines! What the hell? 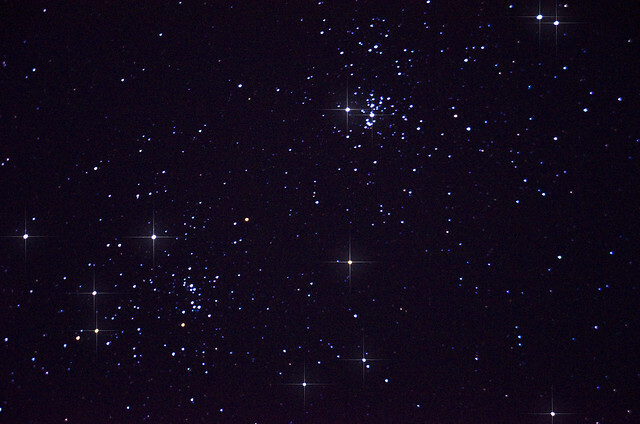 Figuring a possible alignment issue I realigned the scope and pointed towards the Double Cluster in Perseus. Same problem. So, I flattened out the wedge and aligned in Alt-Az mode, same problem. At this point I was getting irate. Nasty words were floating around in the dark and the telescopes parentage was being questioned. With not a lot else to try I ran the mains power out to the scope and plugged into that instead of my Maplin’s power tank and guess what? Yes, everything was fine. So I’d undone my EQ align for nothing, it was down to my crap cheap power tank being ran down with constant slewing with the skytour earlier. 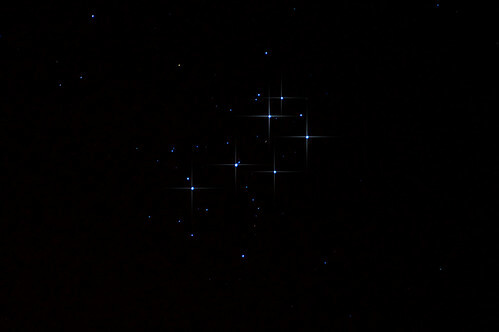 With proper power restored, I managed to get 20s exposures in Alt-Az mode on the Double Cluster and also had another go at Jupiter once I cleared the neighbours tree. Jupiter was a revelation, last time I tried it on the webcam it was a disaster, and this time I could actually see banding on the planet on the capture programme. I didn’t get many shots at it until the not forecast clouds rolled in. I’m sure the met office had a random weather selector, their forecasts seems to have little in common with the weather in the real world. By this time it was near 1am so I packed up figuring the clouds would hang about all night. An hour later I’m back in the garden taking the dog for a piddle and guess what, a fantastically clear night again. Typical. 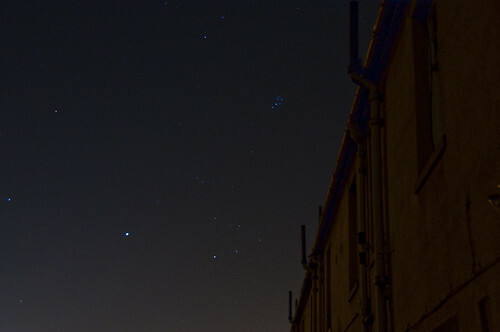 Still, I’m reasonably pleased with the modest haul of shots I got, certainly one of my better nights to date. 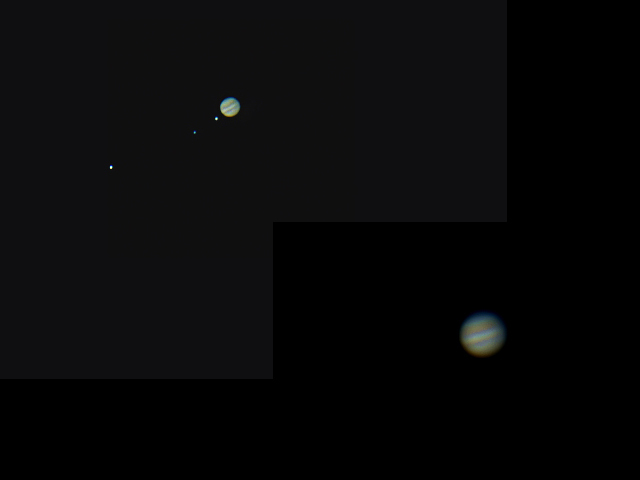 Jupiter, top shot is 2 AVI captures processed at merged to show the planet and the moons. Bottom is a 2x Barlow AVI capture of just the planet. Double Cluster, I’ve added some diffraction spikes to this one in Photoshop, not sure about the effect but I think I like it. 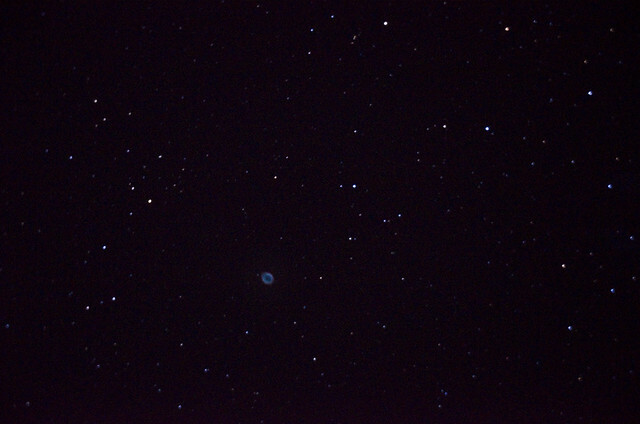 The Ring Nebula, just a single RAW in the end but pleased at how clear the nebula is! 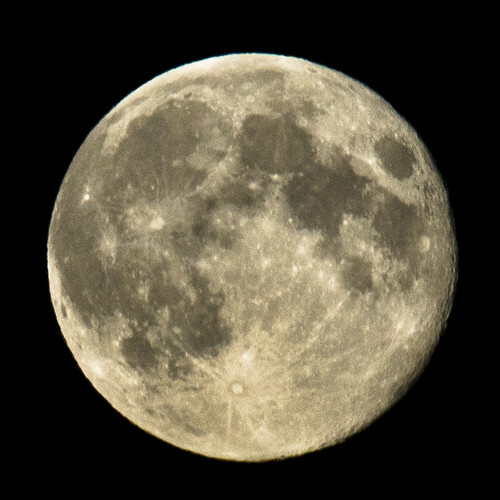 Who’d have thought that within a week of buying a new telescope I’d have had 3 clear nights to try it out? It’s almost unheard of, especially in Scotland this year but not being one to miss a decent chance out came the new Celestron NexStar 5SE. First impressions of this little scope are it’s incredibly well built. Everything about it is solid and the tripod it comes on isn’t a million miles away from the EQ5 I had previously, it’s even got a basic built in wedge. The Alt-Az mount is very different however and must be powered up to use, once you get used to it though it’s pretty easy to use and the GOTO is pretty accurate as long as you take time to align it properly. First night out I made a schoolboy error and didn’t use a dew shield, the result was a dewed up scope once I had it aligned and ready to take a pic or 2. A roll of thin camping mat and some Velcro has done wonders to address that particular issue! 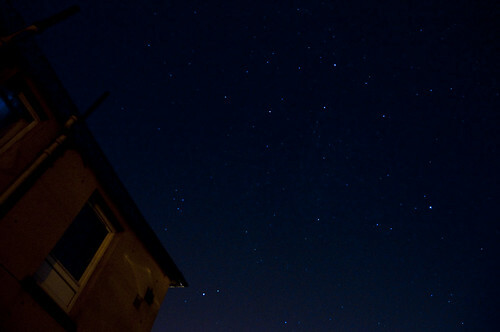 2nd night out was more about getting a decent alignment and trying to get at least one usable shot. Aligning the scope is easy enough. I’ve not managed to get the SkyAlign 3 star method to work yet but the Auto-2 star works fine and if I sync with another 3rd star it seems pretty accurate, in as much as I can see objects in the field of view if not dead in the centre of the 25mm supplied eyepiece. One thing I have noticed is that placing the wedge hinge (even if you are not using it) facing north and making the mount totally level really pays off and it worth taking time to setup properly. Using Artucus and Altair as the alignment stars and then syncing with Vega seems to work fine and since these 3 are visible in the twilight it lets me get setup for the fainter objects in good time. From the first attempts at photography the real pain I discovered was finding the focus point with the camera. It’s a fair bit away from the focus point with the 25mm eyepiece and unless there’s a really bright star in the field of view you won’t be able to focus through the viewfinder. The solution is to use a really bright star and focus with the eyepiece. Switching to the camera you can note which direction to focus and how many turns it takes to get there with the camera. For the 5se, around 1 full turn right is the starting point and from there you can fine tune. 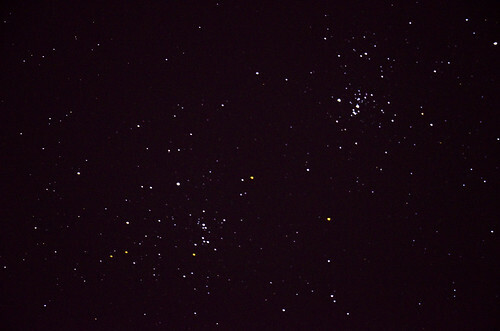 First target of night 3 was the Double Cluster, Caldwell 14 in Perseus. This looks great in the eyepiece and the stars are nice and bright so it was a good first target. Alignment was reasonable and I was able to stretch exposures to about 8s with no star trailing. The end result showed a lot of stars and some nice colours in the stars too. I’ve not attempted stacking yet so these are all single shots in RAW and processed in Photoshop. 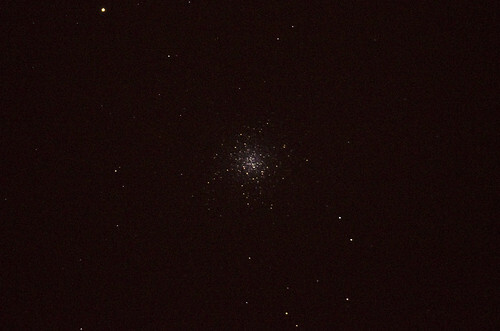 Next target was the Great Globular Cluster in Hercules, or M13. 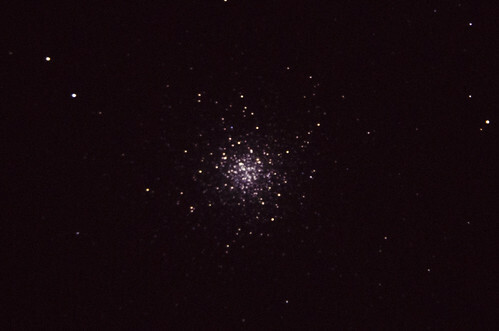 In the eyepiece M13 is just a grey fuzzy patch and there’s not a lot of bright stars around it so I had to go with the one turn right method of focus and fine tune from there. It took a good few goes but I got a reasonable result, which I’m pretty happy with for a first attempt. 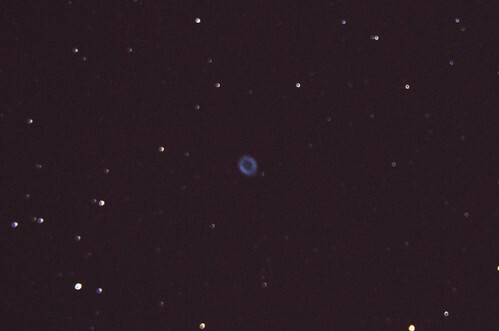 The next target I tried was the Ring Nebula. 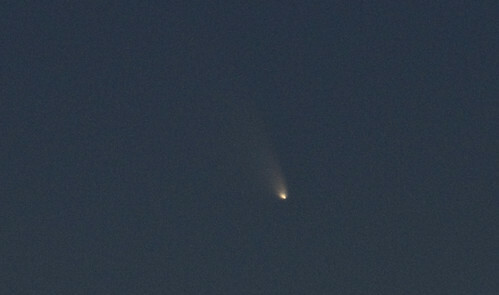 This was visible in the viewfinder using averted vision but very faint. As it was nearly straight up though there wasn’t enough room to fit the camera on the scope with the mount base being in the way so that’ll have to wait for another night when it’s better placed. Next target was the Andromeda Galaxy. I was biting off more than I could chew here and the result shows. We’ll try that one again in the winter nights! 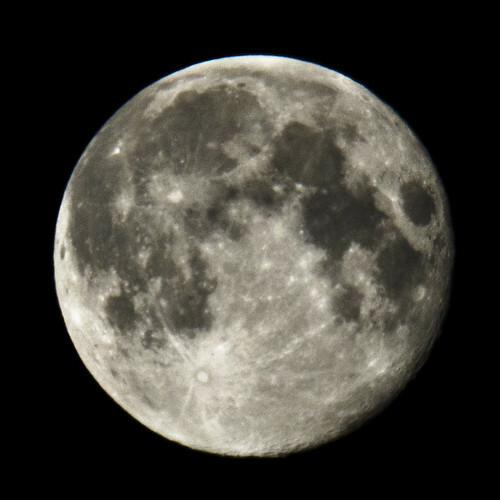 I ended the night up on the Moon as it rose about the houses around midnight and considering it was behind thin cloud the result was pretty good. All in though, a pretty good night and I made more progress with the NexStar 5se in 2 nights than I made with the 200P/EQ5 in 4 months which has to be good. As an aside I should also point out that this is what a rank beginner can achieve with a modest investment in a light polluted area. If that’s not enough to spur you into giving it a go, while out last night on what was a warm and still night I also caught sight of the International Space Station twice and at least 8 meteors from the Perisids which peak this weekend. Space quite simply, is awesome! Equatorial mounts, Newtonian reflectors, refractors, registax, counterweights, polar alignment, autostakkert, wavelets, webcams, tracking motors, collimation, Saturn, Venus, avi’s, sharpcap… Astro photography, it’s enough to put you off just thinking about the bewildering array of stuff to learn. What the hell are those things, where are they, what do they do, how do I use them? Well, with a little perseverance it DOES get a bit easier. Take the telescope and mount to start with. When I first got it I had no idea what I was doing, Even now the EQ5 mount seems more like an instrument of mental torture than something to mount a telescope on but I am getting used to how it works. I’ve never attempted an accurate polar alignment yet mainly due to how late it is in summer until I can see Polaris but even a rough alignment is enough to get you moving. Simply set your latitude on the mount, 55 degrees for Edinburgh point the North leg funnily enough North and make sure the mount is level. It’s not perfect but it’ll allow you a go at some planetary imaging at least. Just doing the above steps I’ve found that it’s adequate enough to keep a planet in the field of view for ages with the tracking motors engaged. It wouldn’t be any use at all for imaging deep space objects but for now, for planets and moon its working ok. The tracking motors too came with the vaguest of instructions, now though I’m confident enough to find my target, lock the clutches and start the tracking and it works fine. 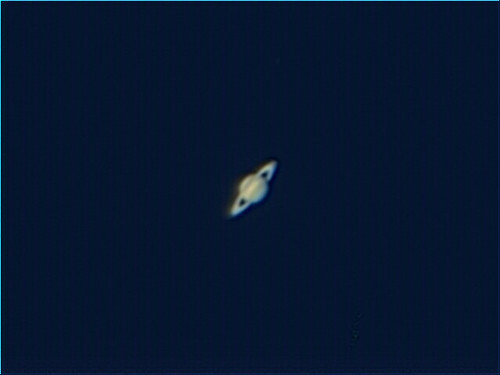 So, as I’d got hold of a Philips SPC900 webcam, all ready to be used with the scope and the skies had cleared it was time to give this planetary imaging a shot. 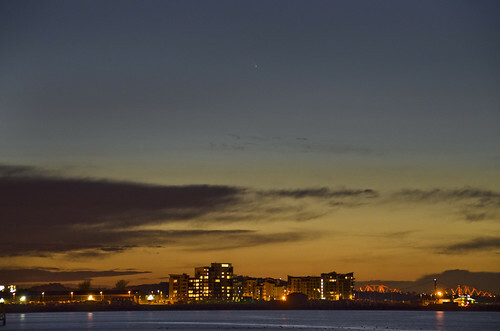 There’s not a lot of targets at this time of year, Venus is rapidly heading for its appointment with the Sun in June and Jupiter is long gone is the twilight sky. Saturn is getting higher and Mars to be honest has never been my favourite subject so Venus and Saturn were to be the targets. When I setup, only Venus was visible in a still twilight sky. 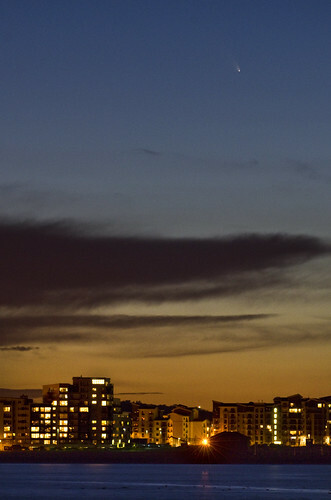 I can’t wait till dark as it’ll be lost behind the neighbourhood roofs. It’s so easy to locate in a twilight sky and the crescent shape is very visible in the scope and it’s quite a thin crescent now too. After centering Venus in the eyepiece I slipped in the 2x Barlow and made sure it was centered and then switched to the webcam. 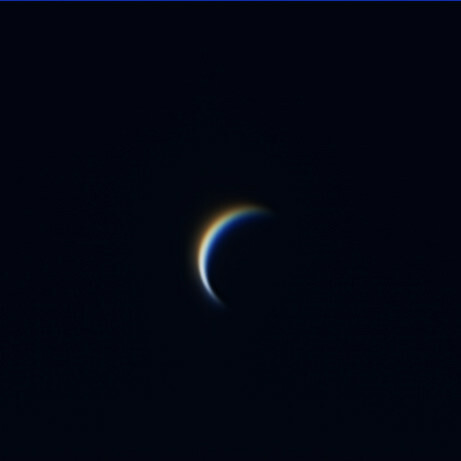 Luckily for me, Venus was still there with the webcam and using the free capture software, SharpCap I was able to get it centered on the camera and adjust the settings till I got a clear view. I got a couple of short captures with the webcam until Venus was lost to the shed roof. I then ran the avi file through another free bit of software, Autostakkert which stacked the best frames from the movie. The resulting image was saved as a TIFF and then opened in Registax 6 where you can adjust the wavelets. I have no idea what a wavelet is but it certainly works and greatly brings out the image detail and sharpness. 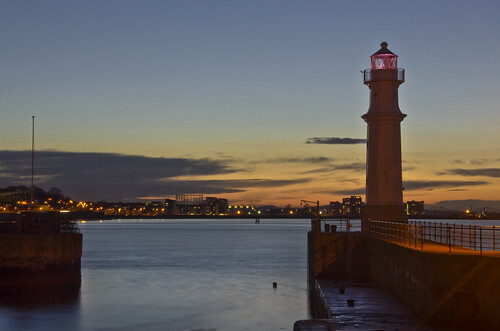 I then finally opened the image in Photoshop CS5 for some final tweaks and this was the end result. A million times better than I’ve managed with the DSLR, the webcams much smaller sensor gives a much bigger final image which in turn lets you get more detail. Using a webcam also lets you capture those microseconds of clarity through the atmosphere where the viewing is at its clearest and the stacking software puts all these together to get your final image. It takes a bit of getting your head around but it does work! It’s probably way too long but after processing this in the same way as the Venus image I got to this final shot. As you can see, there’s a lot more detail in the stacked image, some colour too. For a first shot with this style of imaging I’m pretty pleased especially as the seeing was pretty bad. There’s a lot of room for improving especially with the software end all of which I’ve hardly even scratched the surface of yet. I also need to get hold of a quality 5x Barlow lens to get a larger image. Lots to do, I just a few more clear nights! 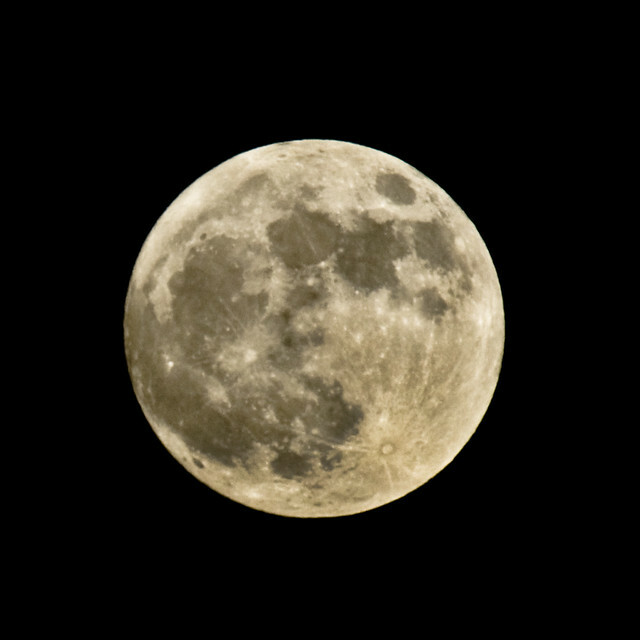 Supermoon fever seemed to grip the online communities on Saturday night. 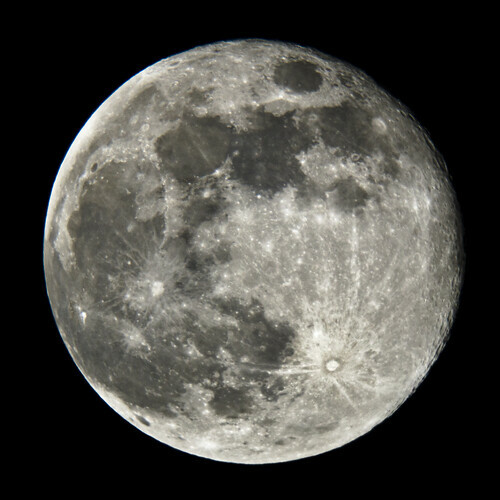 Twitter was buzzing with it as people who would normally pay no interest in our nearest celestial neighbour peered upwards trying to see if the moon was indeed 14% bigger than usual and 30% brighter as the news websites reported. 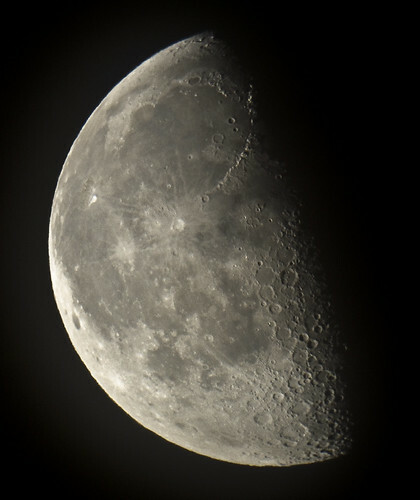 Of course if you hadn’t seen the moon for a few months then suddenly caught it on Saturday it would have looked different, if you look for it all the time you didn’t see much since the move to a big moon is gradual and not all at once. The Supermoon, or perigee moon, is not a once in a lifetime occurrence as the media would have us believe, it actually happens a few times a year as the moon’s orbit gets closer to Earth and then ebbs away again, it’s just some are closer than others, this year’s wasn’t as close as the March one last year but it was still impressive. With the moon’s latest close approach to Earth the timing wasn’t great with regards to the moonrise time still falling in daylight. 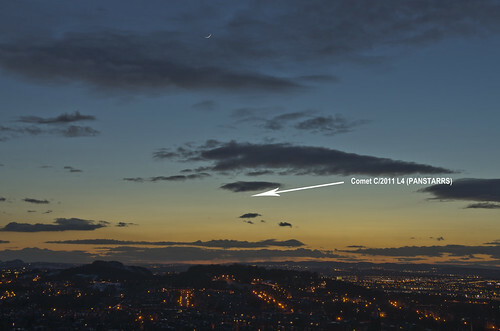 The moon came up over the horizon from Edinburgh at 20.37 and to that ends I was stood on Blackford Hill with a good view to the South East with a Nikon D7000, Sigma 200mm f2.8, 2xtele and photographic tripod and the MacBook pro so I could try some tethered shots. However, as with all good astro plans the weather got in the way dumping a low bank of cloud on the horizon spoiling the fun. The sky was still very light too so gave up and went home in a huff. It didn’t take too long though for the moon to get over that cloud bank and around an hour after moonrise I got my first shot at it from home. Sadly, it was so low I had to shoot from the front garden in-between passing Lothian Buses double deckers and glaring sodium streetlights. This was shot tethered to the MacBook pro with Sofortbild which lets you get a real handle on the focus, the golden glow of the low moon still very evident. About an hour later with the moon higher in the sky I tried again, not tethered this time due to where I had to stand to get the shot (half way up the neighbours stair to avoid a telephone cable). The golden glow has lessened but there’s more contrast and detail. It might have just been imagination but even at midnight the sky still looked almost twilight to the south with that moon shining so brightly. The following night with a later moon rise and more cloud about I wasn’t hopeful of anything at all but it did peek out from between the houses over the road very low down and very orange. Pretty impressive even though it wasn’t a “Supermoon” any longer. The reality here is that any phase of the moon, near or far is a delight to photograph. Despite it being the same subject it’s a challenging subject to get right and atmospherics and cloud play their part too. It’s probably my favourite photographic object and it’s not out of reach for those even with basic photographic equipment. 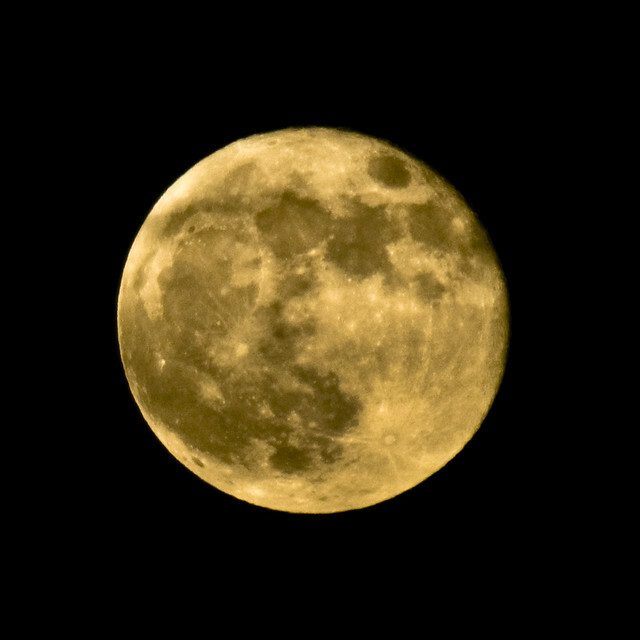 Supermoon or not, give it a try on the next clear day, daylight, twilight or night time it’s always worth a go. After only a mere 3 days of frustration of owning a telescope and not being able to use it for the purpose it was designed, I finally got a clear night to try out a bit of photography with my newest photography acquisition, my Skywatcher Explorer 200P on an EQ5 mount. With a clear sky looking almost certain the hardest part of waiting till it was dark enough to actually see anything in the night sky on Friday night. The moon was coming up frustratingly low and was steadfastly refusing to peek over the top of the house from my back garden so I was forced to wait until the sun had at least waved goodbye for the day. While still in a twilight sky I obviously couldn’t properly polar align, not that in a dark sky I’d probably have had any more luck either if I’m honest! I did make an attempt though, first finding north using the iPhone compass, so it was probably east or something knowing the accuracy of the iPhone compass and I did level out the mount properly too. With this being the best I could do in a twilight sky I made an attempt at balancing the telescope and that was me ready to go. I’d spent time earlier in the day setting up the finder scope so with Venus bright in the sky that where I headed. Centred nicely in the finder scope I looked through the eyepiece to find… nothing at all. After some searching I did find Venus and even in the 20mm eyepiece it was a brilliant sight. The crescent clearly defined and even better, the tracking motors seemed to be keeping it in the field of view as well. So far so good. By this time Saturn had peeked over the top of the house so that’s where I headed next. Despite a glaring moon just below it the view wasn’t bad at all. Easy to find, find the roof and move up, Saturn was an awesome sight, the rings and some of the moons clearly defined in the eyepiece. With the tracking more or less working I got a good chance to try out some single frame shots of the ringed planet before youngest son walked into the 5m USB cable between the D90 and MacBook pro knocking everything out of line again. This was the best I got of Saturn, not exactly epic but I was pleased enough for a first go. Next up was Mars which was… unexciting so I skipped Mars and went in search of the Moon which was still hiding around the front of the house. Moving the scope I got a view of the Moon and within mere milliseconds of getting it in the eyepiece I realised the importance of having a Moon filter. 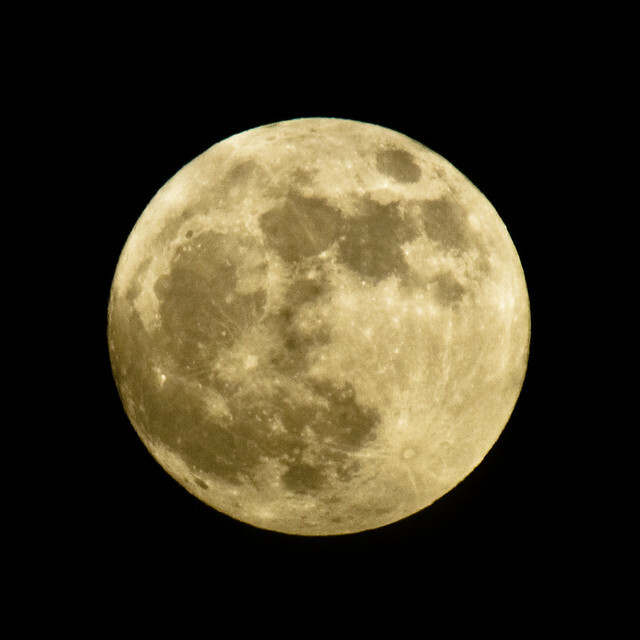 There’s no way you should be looking at a nearly full moon without one. I worried for a bit I had damaged my left eye, the black spot the Moon left in a field of vision a bit of a worry to be frank! Thankfully it subsided and I won’t be doing that again. I did however hook up the camera and use the live view to the laptop to focus and get a few shots, the best of which is below although I’m frustrated at the lack of sharpness in the shot. 1. 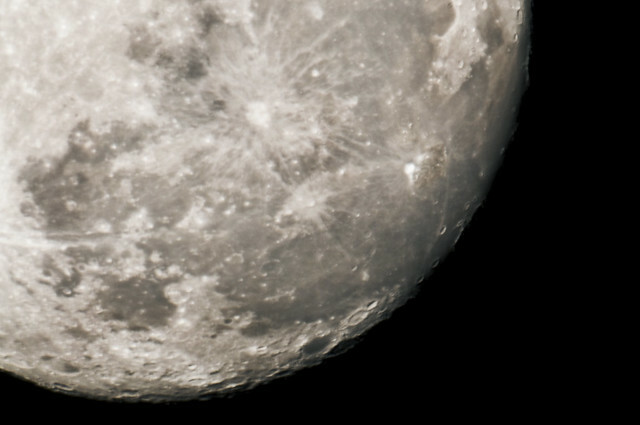 How can I get the whole moon in a single photograph with the camera, the 2x Barlow means only bits at a time and when I tried eyepiece projection the result was more like a lensbaby shot with selective focus! 2. How the hell do you find deep space objects without a GOTO? I’m really thinking I’ll need to invest in the SynScan controller soon. 3. The tracking motors SEEM to work but I’m not convinced, Skywatcher seem to be overly vague in their operation. 4. How the f**k do you balance a telescope for the eyepiece and camera without having to adjust where the scope sits on the rings? 5. Where the hell did all these eyepiece caps come from? As the night wore on I seemed to have more than I had places to fit them? 6. Why do I need a woolly hat, scarf and big jacket in May! 7. Why did I buy such a heavy unwieldy telescope in the first place!